It’s that time of the year again! Bama Football kicks off today and I’ve had several requests for some tailgating recipes, so over the next few weeks, I’ll post some game day ideas. 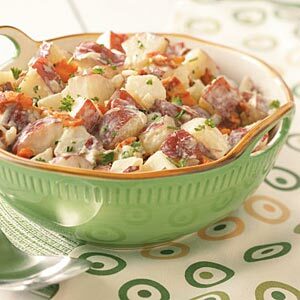 Back in 2007, The Birmingham News asked for one of my composed salad recipes to feature in a special about July 4th cooking so I wrote down my recipe for Bacon-Parmesan Potato Salad. It’s a great salad to enjoy on game day because it can be made days in advance and held in the frig. Not only do I make it for tailgating on the Quad, it’s also the salad of choice I’m asked to bring when we party on the lake. Give it a shot! It’s a great alternative to traditional potato salad! In a large bowl, combine the garlic, green onions, both salad dressings, celery salt, basil leaves, thyme and horseradish. Dice cooked, un-peeled potatoes and add to the wet ingredients, stirring until fully combined. Add the bacon, reserving 1 tbsp for garnish. Add the Parmesan cheese and mix will. Sprinkle remaining bacon atop the salad and serve. This entry was posted in Tailgating Recipes, Vegetable Side and tagged bacon parmesan, bacon parmesan potato, bacon potato salad, fourth of july recipe, holiday recipe, lake party recipe, parmesan potato salad, picnic recipe, picnic salad, potato salad, tailgating recipe by quarlj01. Bookmark the permalink.